Cross Of Iron comes at you full-on and then slaps you across the face. 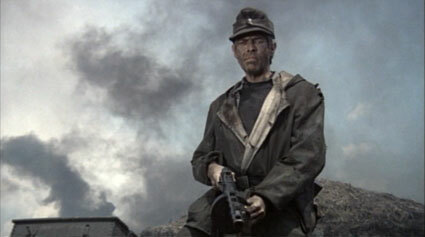 A war film directed by the American master of violence and starring James Coburn. So far, so average. This isn’t just another “Ain’t America Great!” war drama. In fact, this is one of the many surprising things this film has to offer because this is a story as told from the point of view of the Germans. It’s as hard-hitting and brutal as you would expect but so much more. 1943, on the Russian front and highly respected yet disillusioned platoon leader Ralf Steiner has been decorated after another successful mission and given the illustrious Iron Cross. The newly arrived commander, the arrogant yet cowardly Prussian Captain Hauptmann Stransky is only there to earn that same medal. He resents Steiner and wants him out of the picture, especially when he refuses to support him in winning the Cross for a mission he didn’t lead. Steiner, who has a hatred of all commands, has to lead his men away from the front line after being left to die by the Captain. This doesn’t sound like the most exciting film in the world but you would be wrong. Starting off as a traditional war drama, director Sam Peckinpah, notorious for his tough and brutal action films like The Wild Bunch, The Getaway and the controversial Straw Dogs, doesn’t do traditional. His set pieces are spectacular. And many. We get slow motion details of explosions, bullets flying and bodies oozing blood and while these are great for the action fans, as we see the master of these kinds of sequences on full throttle, what also surprises are the scenes in between. 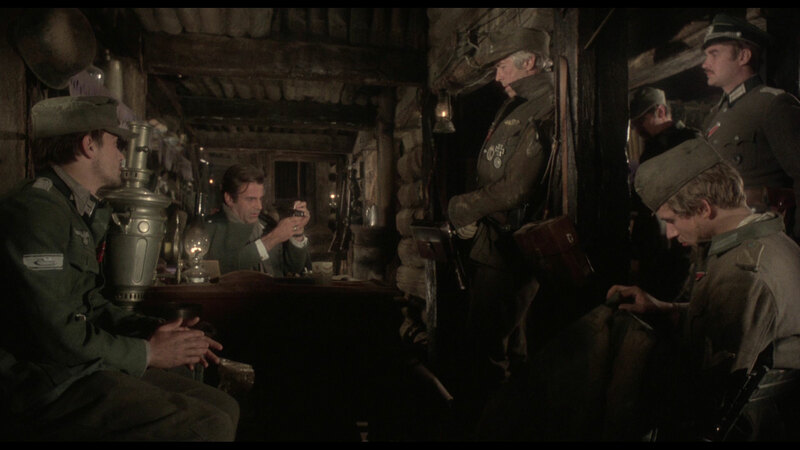 Especially when you realise that Peckinpah had never made a war film before and so choosing a story about the horrors from the view-point of who are normally looked upon as the enemy. We are often shown how war affects the Americans or the Brits but not so much from the Germans, unless they are made by Germans (although this is a German co-production). So having such a macho, all-American director in charge of a story like this does fill you with a sense of awe, as he handles it with such previously unseen gentle hands. You find yourself rooting for Steiner and his men. One sequence, in which a soldier breaks down in front of his officer, asking never to be left alone again, does tug at the heart-strings. You also long for Steiner to get his revenge on the scheming Stransky and you find yourself emoting with his men. It’s unexpected and works like a charm. The casting, though somewhat bizarre, strangely works too. James Mason and David Warner work well as the chief of operations and his right hand man. As do the actors playing the platoon. All have their own characters and they are well-developed considering the amount of screen time they get. Maximillian Schell is perfectly scheming and sly as the power-hungry yet yellow Stransky. You hate him the moment he appears and that hatred grows throughout. James Coburn, who has always been an underrated actor, is superb as Steiner. Perfectly suited for the dramatic action sequences, he handles the more emotional scenes with aplomb. It might seem odd having such a big American name playing a German and though the accent is all over the place, he still commands the screen. There is one miss move in which the platoon come across a barn of Russian women and their treatment by some of the soldiers makes for uncomfortable viewing but thankfully, for one of the soldiers, he does get his comeuppance. I have often avoided watching this and I’m never sure exactly why. I like Peckinpah’s previous films and it has been shown on TV quite a few times over the years. I’m glad I gave it the time it deserved because, although incredibly violent, this is a war film that has a lot more going for it that on first inspection.